One generous serving size. Adjust quantities to you appetite or the number of servings you want to make. Rice Milk, Soy Milk, Almond Milk, or any non-dairy milk that you prefer. 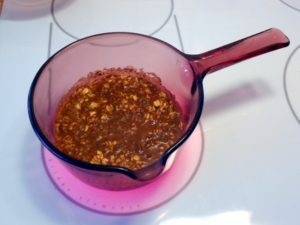 Bring the water to the point of boiling and add the oatmeal, cinnamon and salt mixture, or start heating the water and add the oatmeal, cinnamon and salt mixture. Bring the oatmeal mixture just to the boiling point. Cover with the pot lid. Turn off the heat. Let the oatmeal mixture sit on the burner for 12 minutes. Gas fired cook tops or stoves may require an occasional boost of heat. Electric cook tops or stoves usually retain enough heat sothat your oatmeal will fully cook and still be hot at the end of 12 minutes. If you leave your oatmeal to sit longer, it just cools down, so you don’t need to worry about burning your oatmeal. Spoon your cooked oatmeal into a large bowl. Add 3-6 drops of stevia extract, drizzle on some healthy maple syrup, and pour on your favorite non-dairy milk. Enjoy your Vegan Cinnamon Maple Oatmeal breakfast and have a happy day!